Book in for the 2013 Women Writers Challenge! Which of the many books on your to-read list will you pick up (or click on) next? If you’re as indecisive as me, it’s a struggle each time. In 2013, I will have a mission to guide me. I’m signing up for the second annual Australian Women Writers Challenge, with a plan to read 27 books by Australian women writers, many of which have been gathering dust on my real and virtual bookshelves for years (the full list to come in a future post). 1. What is the Australian Women Writers Challenge all about, and what inspired you to launch the campaign? 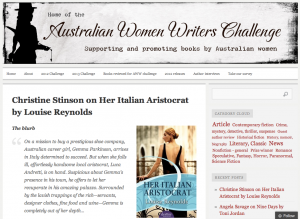 The Australian Women Writers Challenge is a reading and reviewing challenge organised by book bloggers. It asks people to sign up and read, or read and review, a number of books by Australian women throughout the year, and to discuss them on book blogs and social media. Through the challenge, we hope to draw attention to and overcome the problem of gender bias in the reviewing of books in Australia’s literary journals, and to support and promote books by Australian women. Indirectly, the challenge was inspired by the VIDA count, an analysis of major book reviewing publications in North America and Europe. This count revealed that male authors were far more likely to have their books reviewed in influential international newspapers, magazines and literary journals than female authors. An analysis of Australian literary pages by Bookseller + Publisher showed a similar bias (reprinted in Crikey in March 2012). From my own experience I know the problem isn’t just with male readers not reading books by women; it’s more entrenched than that: women, too, are guilty of gender bias in their reading. This is part of a much larger problem of devaluing work labelled as being by a woman. A 2012 study quoted recently by Tara Moss demonstrates that this bias exists independent of the actual quality and content of the work (see excerpt here). To help solve this problem, the Australian Women Writers Challenge calls on readers to examine their reading habits and, if a bias against female authors exists, work to change it by reading – and reviewing – more books by Australian women. The quality of the work is there: it’s up to us to discover and celebrate it. 2. Is it just a coincidence that the challenge arrived on the scene around the same time as the Stella Prize for Australian women’s writing? The challenge owes a lot to the people who created the Stella Prize. Kirsten Tranter, one of the Stella panelists, wrote about the VIDA statistics in early 2011, as did many others in the early part of that year. Without the Stella Prize, the challenge wouldn’t have been the success it is. 3. How highly would you rate the influence of Miles Franklin on all of this, and why do you think she has become such a symbol for women writers in this country? The Stella panelists chose Miles Franklin as a symbol, I believe, because no women were shortlisted for the Miles Franklin Award in 2009 and 2011, despite the prize having been established at the bequest of a woman – one who, incidentally, chose to publish under a male pseudonym. I can see the strategic reasons for adopting Franklin as a symbol, but I also think it’s a symptom of the problem. There are far more talented Australian female authors. There are also other literary prizes that have been going for years that don’t get anywhere near the publicity of the Miles Franklin Award, such as the Barbara Jefferis Award and The Kibble and Dobbie prizes. To be honest, I hadn’t even heard of these awards before I started researching books to read for the challenge. Why is that, unless it has something to do with the fact that they, in varied ways, celebrate women? 4. A year on, do you feel the campaign has been a success? The challenge has been a huge success. The Huffington Post Books blog published a wrap-up of recent releases of books by Australian women, Overland blog announced 2012 as The Year of Australian Women Writers, it has been mentioned on Radio National, and the Sydney Morning Herald’s Daily Life blog counted it among the 20 Greatest Moments for Women in 2012. I couldn’t have hoped for more. 5. How important has social media been to its reach? Twitter especially has a major force in getting word out about the challenge, and has helped publicise the many reviews now linked to the blog (well over 1300). Recommendations via book bloggers and, to a lesser extent, Facebook have also been important. The real spikes in terms of hits on the blog, however, have come after mentions in traditional media. 6. You’ve done some survey research into AWW’s impact. Have you seen the results of that research yet? A brief look at the results has revealed that the majority of respondents didn’t sign up for the challenge, but had heard about it; a majority of these also happened to read more books by Australian women this year. There are many other factors beside the challenge which have raised the profile of books by Australian women in 2012, so the challenge can’t take credit for this result, but it is a very encouraging trend. Of the people who did sign up for the challenge, a majority read more books by Australian women than in previous years, and most reviewed more and read more broadly. A majority of respondents credited the challenge for their having a greater awareness of authors’ names, book titles and a sense of the breadth and diversity of genres being written by Australian women. 7. Do you have anything different planned for AWW in 2013? In 2013, the challenge will remain basically the same, with the aim to read and review more books by Australian women. One change is that there will now be a ‘read only’ option for people who are reluctant (or too time poor) to review. This is a gamble – as it could easily diffuse the challenge’s goal. But it is my hope that people who sign up for this option will actively participate in the challenge. How can they do that? By discussing books they’re reading on social media, using #aww2013 on Twitter, posting comments on the AWW Facebook page, discussing the books in the AWW GoodReads group, and – especially – by commenting on book bloggers’ reviews. Book bloggers have made a huge effort to read and review these books and I’m sure they appreciate people commenting. 8. Are the goals for the campaign the same, or have they grown with the movement? The goal for the challenge remains to help overcome gender bias in reviewing, and also more generally to support and promote books by Australian women. 9. How can readers, authors, publishers, booksellers, the media and bloggers get involved? The best way to get involved is to sign up to the challenge, to pledge to read and review books by Australian women in 2013, and to encourage others – friends, co-workers, family members, book group members, local librarians, school teachers and bookshop owners – to join as well. You can sign up here. 10. Can men participate (of course I know they can, but you never know, some might be too shy unless you extend them a really warm invitation!)? Men are very welcome to participate – as they were in 2012. One male participant in the 2012 challenge was David Golding who recently wrote a wrap-up post on his participation which included a call for more men to sign up. 11. Who is/are your favourite Australian woman writer/s? This is a tough question. I can honestly say my knowledge of books by Australian women is still too limited for me to have a favourite or favourites. This year I have discovered a wealth of genuine talent – world-class authors I didn’t know existed this time last year – and I’m convinced there are many more to discover. My favourite genre is crime, particularly psychological suspense, and in those genres I’ve enjoyed the work of Wendy James, Rebecca James, Sylvia Johnson, Sara Foster, Caroline Overington, Angela Savage, Sulari Gentill, Nicole Watson, PM Newton and my friend Jaye Ford. But one of my goals this year was to read widely, which means I’ve read a lot of single books (46 so far) by different authors. The only authors I’ve repeated have been Gail Jones, Charlotte Wood and Margo Lanagan (two each). It’s not enough to go on to develop a favourite. 12. What were your top three reads by Australian women writers this year? 13. What are you planning to read next? I’ve just finished Tender Morsels by Margo Lanagan, an emotionally devastating and imaginative speculative fiction novel, and before that was Annabel Smith’s Whisky Charlie Foxtrot, a very readable literary book about sibling rivalry. I have a huge stack books by Australian women to read, both recent releases and older titles, but I’m also keen to get back to my own writing which I’ve neglected this year while working on the challenge. Creating the new websites has required fulltime work for the past few months, and I need to get back to my own writing. 13. Could you tell us a little about your own writing? Has your work on the challenge pushed your own literary career along? I started writing novels after I finished my PhD (in 1995) and I’ve had success in competitions with several romantic suspense novels and a fantasy title, but so far no acceptances from publishers. My latest story is a page-turning psychological suspense novel which draws on some hair-raising encounters I had working as an intern counsellor at a private hospital, as well my experience growing up with a schizophrenic father. Earlier this year I attracted the attention of literary agent, author and former editor, Virginia Lloyd, who loved the story and agreed to represent me. With a great team now supporting the AWW challenge, I hope to get on with writing my second psychological suspense novel in 2013. Have I been inspired by what I’ve read? Without a doubt. It has also been intimidating to see the depth, breadth and quality of the work that is out there – work that clearly doesn’t get the attention it deserves. It’s scary, in a way, to go back to my own writing now with this new ‘anxiety of influence’. I would love to write with the richly textured imaginative flair of Margo Lanagan, or the terrible emotion of Eva Hornung, or the compassionate humanity of Charlotte Wood. I would love to write crime with the sense of history and stylistic precision of PM Newton, or have the exquisite appreciation of nature and human heartbreak of Favel Parrett, or the contemporary feel and nuanced characters of Emily Maguire. I’d love to write suspense, mystery and history with the scope and readability of Kate Morton – and to have my books be half as popular with readers. I doubt I can do any of those things and I feel grief about that. I know the next step in such thinking would be “Why even try?” But what I can do is what I’ve always – sometimes hesitantly – tried to do: to write as skilfully and honestly as I’m able, informed by who I am and my unique experience of the world. If one day I get published and find readers who enjoy reading the stories I’ve created, great: that will be a dream come true. If not, at least I can be an active and appreciative reader of those writers who have a great deal more talent than me. Posted on December 24, 2012 March 21, 2016 Author Charlotte HarperCategories Book News, Charlotte HarperTags Australian Women Writers Challenge, AWW2012, AWW2013, blogging, charlotte wood, Elizabeth Lhuede, emily maguire, eva hornung, Facebook, favel parrett, gender bias, GoodReads, Kate Morton, margo lanagan, miles franklin, pm newton, reading, reviewers, reviewing, Stella Prize, Twitter1 Comment on Book in for the 2013 Women Writers Challenge! I’m rubbing my eyes today after waking at 3am to get ready for an early flight home from Brisbane, where a crowd of emerging writers spent a festive weekend discussing all things digital. Check out #ewfbris on Twitter and the Emerging Writers Festival’s website for a full run down of the action – I’ll be posting some more on it here soon. Festival organisers Karen Pickering and Lisa Dempster in Brisbane. As requested by a couple of attendees, here’s my presentation from Saturday’s Working online event (“Our panellists hash out how they make new technologies work in their writing careers, from finding markets, marketing to making money!”). Hopefully some of the social media tips will be of use. 18 months ago I had an argument about Facebook and Twitter with a writer friend who worked for a federal minister. She couldn’t see any business or government application for Social media, believing it would only ever be a tool for communicating with friends and family. Try telling that to the makers of hazelnut chocolate spread Nutella now. They have 11 million international Facebook fans. Or in Australia, to Chux. With posts like “who wears the washing up gloves in your house?” they’ve attracted 14,000 fans – all happy to read about dish cloths alongside updates from friends in their Facebook feed. Facebook has more than 10 million unique Australian visitors per month. YouTube is not far behind with 9.9 million. Blogspot and WordPress combined receive 6.6 million unique visitors, linked in 1.8 million and Twitter 1.6 million. Social media marketing expert Tom Voirol, of digital agency Reading Room, told me this month that not being present in social media is like cancelling phone lines or email accounts. He also provided a great analogy: if advertising is like archery, social media is like ping pong”. So it’s not about broadcasting to your followers or fans, but engaging with them, by starting and joining conversations, by sharing compelling, useful, original and relevant content, and by being an authentic online voice. So, how does an emerging writer get started with social media? I’d recommend you do some online research. Check out Wikipedia definitions of platforms, and blogs about social media like Mashable, ProBlogger, Digital Buzz and Social Media News Australia. Looking at how others are using digital communications tools is a vital and ongoing part of the process. Where are the conversations you’d be interested in taking place? Who are the influencers? What are they talking about? When? The members of today’s panels would be a great place to start. I’d also recommend you follow Bookseller & Publisher, this very festival and ifBook along with your state writers centre. Once you’ve sussed it all out, you can join in, either as an individual, or by creating a brand as I did. Either way, choose a niche you’re passionate about and in which you have some expertise, and build your persona around that. It might be corgis or chick lit or cottage gardens. For me it was vegetarian Italian food and, separately, ebooks, digital publishing and related technology. Lock that brand in for yourself across the major social media platforms and Register domain names. I recommend WordPress for blogging, Crazy Domains for registering a domain name and JustHost for web hosting. Set up a LinkedIn profile for professional networking, Facebook page (not a straight profile – for business purposes you need a page so that you can attract everyone rather than just those who actually know you to like your work), Twitter account (to follow anyone in the world who might be talking about an area of interest), Google + profile (it’s the newest of the major platforms, and allows you to divide your networks into categories called circles) and a YouTube channel for video or slideshow content sharing. Take lots of photos and videos to share. The iPhone 4 and the DropBox app changed my life on this front. Get some business cards printed. Include details of your social media accounts (make sure you get vanity URLs first). Start commenting on your blog on everything that happens in your chosen field. Attend every relevant launch, conference or jam jar opening and post on it. Pitch opinion pieces, reviews and features to relevant newspapers, magazines or websites. Comment on similar blogs and related stories on mainstream media sites. Retweet links to blog posts or articles by fellow bloggers and writers. Set up a list of your most useful Twitter contacts and check it religiously. Make sure you monitor all your channels regularly and respond quickly to direct messages and often to mentions. You’ll need to set aside time to do this just as you would for any other tasks that are essential to a business, like paying bills or responding to emails or phone calls. Share information and knowledge freely and generously … But advisedly. You want to be recognized as a trusted source. Be a good digital citizen. Respect the copyright of others. Credit and link back when possible. Don’t vilify or defame anyone (and that includes Andrew Bolt). Post as often as you can, without setting precedents or creating expectations you can’t live up to. People will ignore you if you just log on once a month to tweet out a link to a blog post, or tell them where to buy your new ebook. Consider establishing yourself as an influencer on specialist platforms like social reading site Goodreads.com. Once you’re established, you can think about campaigns to build follower numbers or promote particular events or publications. Tom Voirol suggests building a campaign around a core idea that is easy to grasp for the public, aligned with your overall goals, measurements and success criteria, and, most importantly, has social interaction at its core. Speaking of measurement, it is important to track your success. Facebook offers great analytics to users of its pages. There are plenty of standalone free and paid tools you can use to assess the reach of your blog posts. Stats like these can help you decide when to post, and which topics have the most traction. Will any of this work? Like anything, it’ll depend how much you put into it. For me, the vegetarian blog, vegeterranean.com.au, fulfilled my desire to write restaurant reviews and cookbook reviews, and led to my recipe creator mother having a meeting at Penguin about a possible cookbook. I’ve devoted more time and energy to ebookish.com.au, which solved my problem of being a former literary editor and tech writer who would love to be more involved in the book industry but is stuck in Canberra. It’s helped me to make friends and build a network of contacts in the publishing hubs of Sydney and Melbourne and further afield. It led to a paid blogging gig for online bookseller Booku.com [Yay Booku!] which I love, board membership of the ACT Writers Centre, a series of teaching and training gigs in social media, and an invitation to look at doing a PhD on a related topic. The biggest surprise for me has been discovering that there are plenty of completely like-minded ebook and social media geek friends in Canberra after all. I just needed to get onto global forums to find them. It’s not just the way we read, write, publish and buy books that’s changing. It’s the way we talk about them, too – today’s announcements from Kobo, GoodReads and Facebook are just the latest in a series of social reading developments. GoodReads is set to integrate with Facebook's new 'timeline'. The Federal Government’s annual Get Reading! campaign (which continues till the end of this month – you can buy the books here) is once again leading the way when it comes to social ways to bring us back to books. Their website includes forums like this one on ereaders (you can sign in using your Google, Facebook or Twitter account) for the first time this year. They’ve also got active and friendly Facebook and Twitter profiles. You can post your own review of the “50 Books You Can’t Put Down” (here’s my brief equivalent: I’ve read Jessica Rudd’s short story “Pinata” in the free book available to those who buy one of the 50 titles, 10 Short Stories You Must Read in 2011, and found it poignant, romantic, clever, fun and original). Get Reading! offers dedicated iPhone, iPad and Android apps too. I’m surprised to see that according to the PDF catalogue of the 50 books on the Get Reading! site, there are still some titles that are not available as ebooks. OK, surprised, and ANNOYED. With the publishers, that is. Come on, people, catch up with your customers’ needs and wants. Another initiative to encourage Australians to get reading is The Novel Challenge, the adult equivalent of the MS Read-a-thon. I looked forward to the latter every year as a child, and am finding myself feeling the same way about the grown-up version. It’s a great way to push yourself along with the reading, and raise money for a good cause at the same time (they’ve raised more than $70,000 so far this year). The program has been underway for a couple of months, but you can sign up to read as many books – and attract as much sponsorship – as possible in 30 days during October. And why wouldn’t you? You’re probably going to be reading anyway. I love the fact that you can sign up as an individual or team, and track your progress in comparison with other participants online. The website allows you to set up a Facebook-like profile page to document books read, those you’re planning to read, and funds raised. Buttons allow easy sharing of the link on several social media platforms. Feel free to sponsor me. I need an incentive to get into my current book (not a strong opening chapter, obviously, as I put it down a few days ago and have felt no compulsion to return). In any case, I feel somewhat frustratingly as though I’ve been too busy talking about books and writing (in new, digitally social ways) to get much reading done lately. In the past month I’ve participated in setting the program for if:book’s Bookcamp unconference on the day it was held as part of the Melbourne Writers Festival, and contributed $45 via crowd-funding platform Pozible to ensure the Emerging Writers Festival’s Digital Writers Conference in Brisbane actually happens on October 14 (see their website to find out how the organisers raised $4000 ahead of the event, and for program details). At another event in Canberra, the Australian Security Research Centre’s forum on developments in e-publication, there was no need to take notes during sessions or swap contact details with delegates during the tea breaks. The Centre collated selected business cards and PowerPoint presentations and emailed them to all attendees a few days later. Highlights of that event included hearing about ANU E Press’s ground-breaking digital publishing model (they have 3-6 staff and publish 50-60 ebooks a year), the National Library’s ebook program (next month they will publish three titles simultaneously for print and digital readers while work continues on a multimedia or enhanced ebook due out next year), and the ACT Government’s iCabinet program (IT staff worked – with some tips from Federal spooks – to “lock down” iPads so that ministers can securely store and view cabinet documents on the go). As for talking to my friends about books, while I continue to attend regular book club meetings (we’re talking about The Slap this month, timely given the television adaptation is about to premiere), I’ve also signed up to the aforementioned social reading platform GoodReads.com. GoodReads allows you to quickly and easily share your thoughts on books you’re reading or have read, and to view reviews and star ratings from fellow book lovers. It offers lists of must-read titles in areas of interest (the best books of the 20th century kept me scrolling and clicking for hours), and even allows you to scan barcodes from the books in your existing library to add them to your own chosen categories. It’s a great way of keeping track of what you’ve read and what you like (or don’t), and making sure you retain a healthy ratio of classics and literary fiction to genre and trash in your mix. So, Facebook friends, beware, GoodReads updates aplenty are coming your way. Speaking of being wary, part of me is just that about Facebook’s announcements today, but hopeful too. Personal recommendations from like-minded friends and colleagues are a great way to find new favourite authors and reads. Charlotte’s posts on books, digital publishing and social media also appear on Twitter (@ebookish), Facebook (www.facebook.com/ebookish) and at ebookish.com.au.